Chips with a tensile strength. That’s what TJ should call these. I’m sure tensile strength is the wrong term but these are some buffed up chips. There used to be something called truth-in-advertising. In fact, if you follow the link in the previous sentence, it still may exist, even if only in name. Sadly, the general truthfulness of most advertising is difficult to find. Whatever the status for the rest of the universe, this one shining example of tortilla chips proves there is still a glimmer of life in advertising that is truthful. On the back of the bag TJ writes “… each has a delicate crunch yet are big and sturdy enough for dipping and make fantastic nachos.” I can’t attest to the dipping and nacho part, but these are one strong chip. The thickness is the first thing you’ll notice when you pick up one of these chips. The second thing will be the stiffness of the chip. 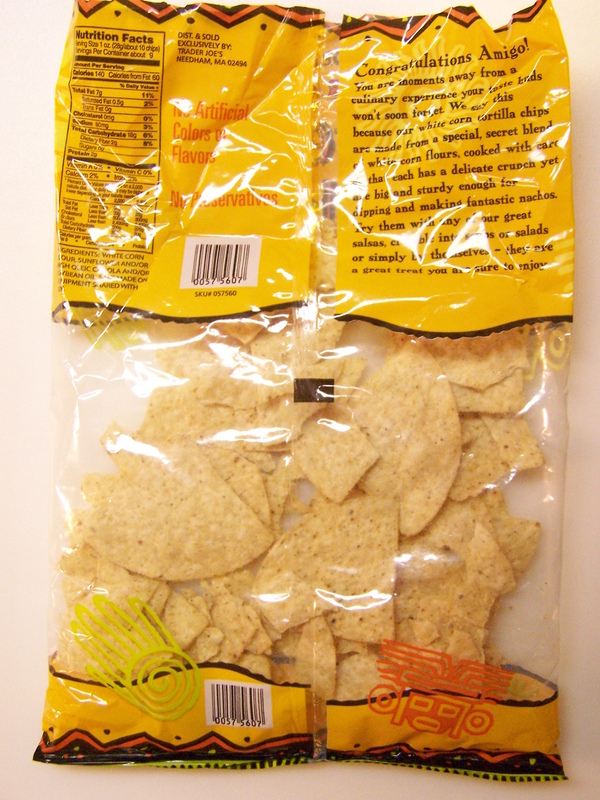 The third thing you might notice is that 3/4 of the chips are NOT broken up into useless small pieces at the bottom of the bag like many other packaged tortilla chips. Still, even with the carbon fiber reinforcements that surely must be in these chips, they perform as tortilla chips in the mouth. Going back to the truth thing, remember that corn is a carbon based plant product with fibrous components (hence carbon fiber). As implied, the chips do have crunch to them. They taste like corn chips. 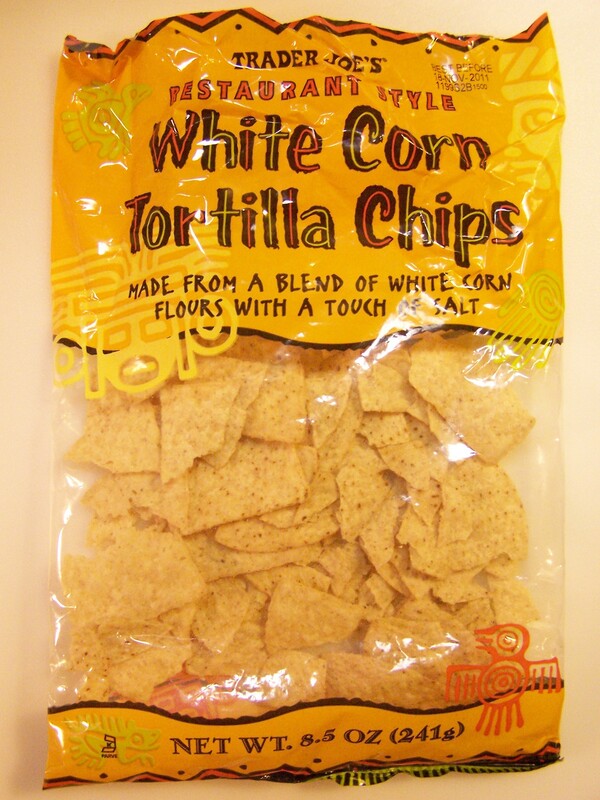 There’s a little more salty taste to these than many of the other TJ chips. That’s always a positive for me. Since I was hungry and didn’t feel like going to extremes, I tested these by simply spreading some shredded Monterey Jack cheese on the chips, nuking them for about 20 to 30 seconds until the cheese melted, and then putting a few pickled Jalapeno slices on the cheese, with a few spoonfuls of the Jalapeno liquid. The chips passed the torture test. The “dish” tasted just fine. The hunger was diminished. What more could we ask? If TJ would only stop changing their chips and crackers and keep the good stuff like this, or the now long gone fan favorite Identity Crisis Chips, on the shelf, we wouldn’t need to journey out in search of the truth each time we get hungry for a tortilla chip. That would be way to easy. I ate most of the chips before I remembered I needed the pictures. This entry was posted on 09/27/2011 at 00:22 and is filed under Recipes, food, cooking and related items, Trader Joe's. You can follow any responses to this entry through the RSS 2.0 feed. You can leave a response, or trackback from your own site.